Jamie Earnest created paitings for her "Meeting of the Minds" project, "Your Home or My Home?" Research can inspire a paint stroke. 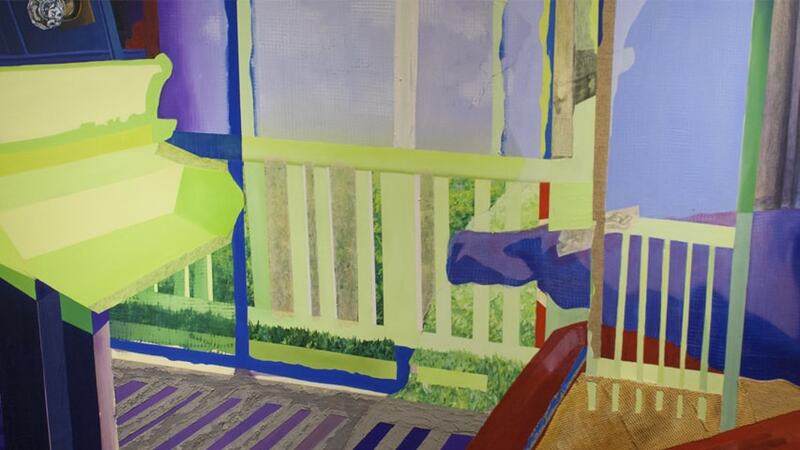 It did for Jamie Earnest, a senior art student, who will exhibit her work in "Meeting of the Minds," Carnegie Mellon University's annual undergraduate research symposium from 10 a.m. to 5 p.m., Wednesday, May 4 in the Cohon University Center. Earnest is one of more than 600 students who will participate in the event, now in its 21st year, organized by the Undergraduate Research Office (URO). She was funded for her research through a Small Undergraduate Research Grant (SURG) from the URO. Her project, "Your Home or My Home?" gave her an opportunity to expand work and explore the use of signs and symbols. She has already shown work in New York, Miami, Houston and Pittsburgh. "This project has allowed me to tap into the world of semiotics and an area of emotion I cannot reach by myself," Earnest said. "I used to draw inspirations for my paintings from my own experiences, which was fulfilling, but became old. I started to become interested in portraying other people's stories visually based on the words they told me." Earnest interviewed subjects about places they lived and then used objects and color to create paintings to evoke emotions. "One piece I created was based on a person's memory of her backyard and specifically her screened-in porch. All of her memories focused around the ideas of seduction and danger, the joys of experiencing extreme adventure as a small child in a seemingly large world," Earnest said. "I used these explained emotions to decide on the color palette of my painting. One of the main colors echoed throughout the piece is a neon yellow-ish green, which at first glance is kind of an alluring and radiant color, yet over time it becomes toxic and sickening within the picture," she said. Meeting of the Minds introduces research projects — and the talented undergraduates behind them — to the community, said Stephanie Wallach, assistant vice provost for Undergraduate Education. "It is an event that invites people into our living rooms, to get an up-close and personal look at what we do at Carnegie Mellon," Wallach said. "Meeting of the Minds is unique because we have all disciplines under one roof to communicate our research expertise. Every year there are new ideas, new projects, new people who amaze you with their creativity," she added. The creativity, innovation and collaboration that take place between students and faculty leading up to the event are a hallmark of the CMU experience. Senior psychology major Maya Schumer has been collaborating with Associate Professor David Creswell on several projects related to his research on mindfulness meditation, including a meta analysis of available research to determine how effective brief training in mindfulness is as a mental health intervention. Her Meeting of the Minds project, "The Stress buffering effects of self-affirmation: a pilot study," is funded by the National Science Foundation and Small Undergraduate Research Grant (Spring 2016), and it builds on Creswell's meditation work. Schumer will build on her work with a summer undergraduate research grant that also will focus on self-affirmations, which relieve stress. "The goal of the self-affirmation study is to find a neural correlate of self-affirmation, hypothesized to be the ventral striatum, that also buffers stress in response to a stressful situation," she said. In previous studies, research has shown that self-affirmations are associated with neural activity in the area of the brain associated with cognition. However, studies have yet to determine if the reduction in stress is being driven by the neural activity, which is what Schumer is examining. Meeting of the Minds projects can be presented by individuals or groups. One team hopes to bone up the skills of chiropractic and osteopathic students. "Chiroproktor," a teaching tool that models the spine, can be used to replicate a range of misalignments for inexperienced practitioners. The idea started with Torrell Jackson, who is graduating this year with an MBA from the Tepper School of Business. Students from Conrad Zapanta's biomedical engineering course said they joined the project because they felt they could make a difference. The team — Jackson, along with seniors Christopher Chao in electrical and computer engineering, Nicole Kawakami in materials science and engineering, Eric Parigoris in mechanical engineering and juniors Meave Higgins in chemical engineering and Lauren Zemering in design — is part of CMU's Innovation Corps (I-Corps) Site. The site, supported by the National Science Foundation, is designed to help commercialize innovations based on customer discovery and product adaptation. The team is in the process of applying for a NIH grant.